Whipped wheel is also known as whipped spider’s wheel, raised spider’s web wheel, ribbed wheel, back stitched wheel, and back stitched spider’s web. All of these names do little to indicate how much fun this stitch can be. It would be one of my favourite textured stitches. 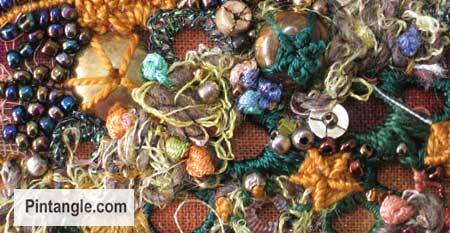 If you look closely at much of my stitching you will find them tucked into all sorts of places. Whipped wheel creates a ribbed disk that can be worked on an even or uneven number of spokes. 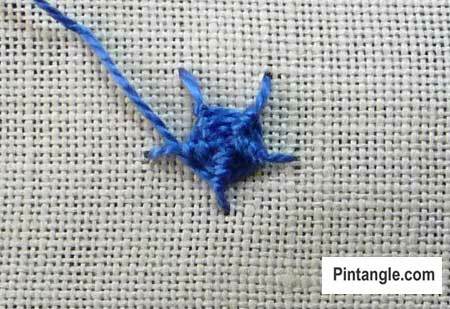 Start with a single fly stitch. Each side of the fly stitch tail add two straight stitches of equal length. You should have a circle which has five ‘spokes’ to form the foundation. Bring your thread up at the centre of the wheel. 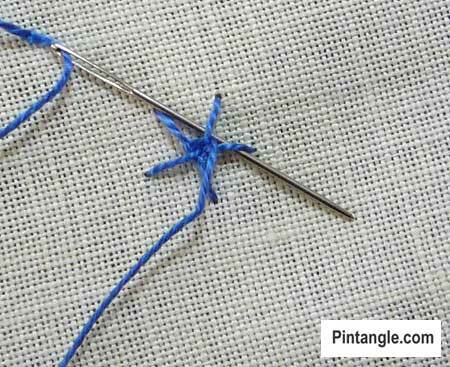 From this point onwards your needle does not go through the fabric so use a blunt tapestry needle to avoid splitting the foundation stitches. 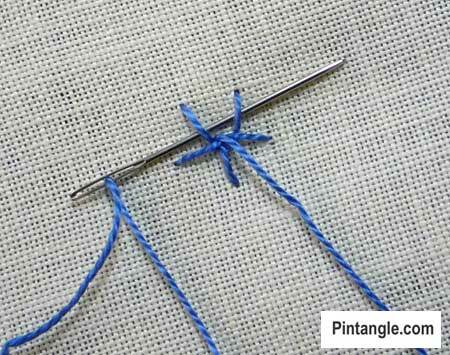 Slide the needle under two threads and pull your thread through. 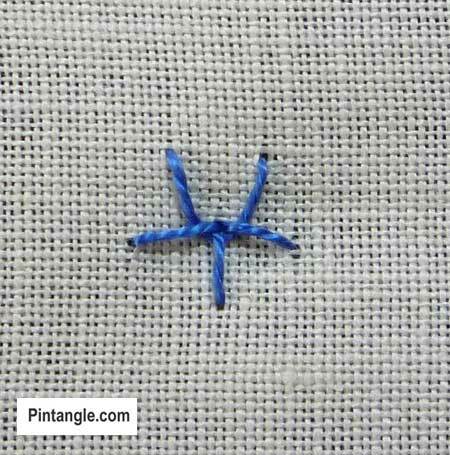 Move back one stitch and once again slide the needle under two threads. Pull the thread through and you have whipped the first spoke. 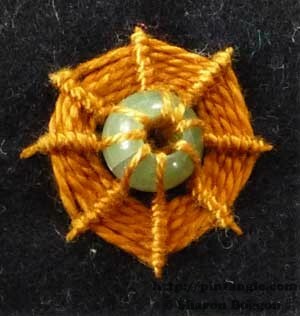 This process is best described as making a spiral of back stitches over the spokes. Repeat this action, whipping each spoke as you progress around the wheel until the circle is filled. 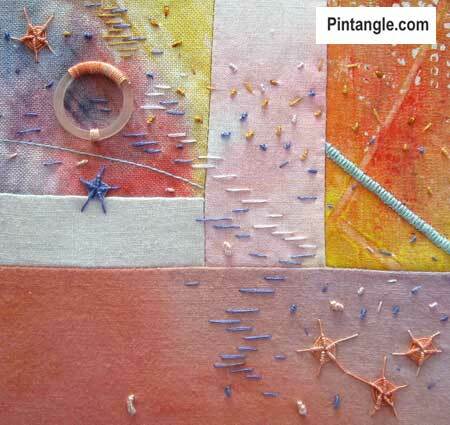 As I said Whipped wheel is a stitch that is lots of fun and once you have mastered them they are quite quick. You can used them alone as an accent stitch, a point of colour, an interesting texture, or they can be scattered over an area almost like a powdered filling. 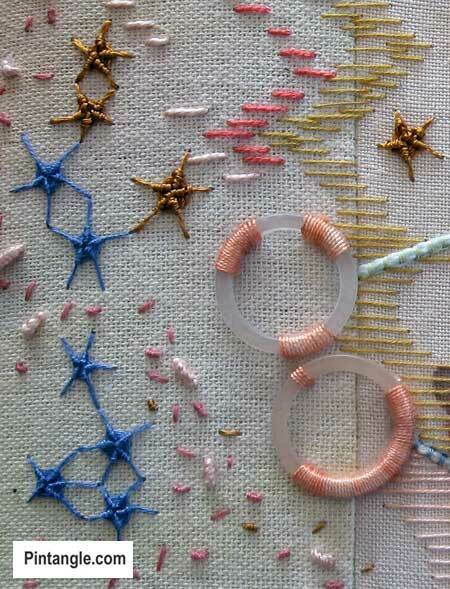 Whipped wheel stitch is great in contemporary embroidery. 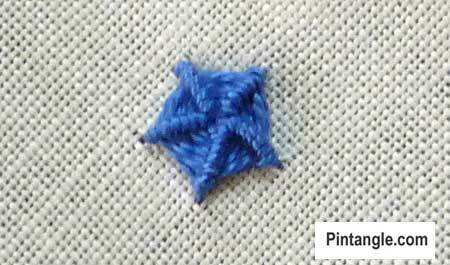 This sample have whipped wheels worked in cotton perle #8 (the blue sttiches) and rayon thread (the bronze gold stitches. 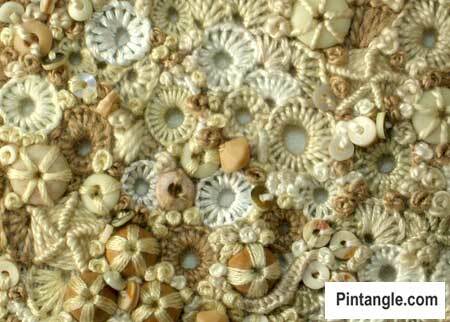 This sample is whipped wheels worked over machine embroidery. The foundation fabric is hand painted felt. You can have Pintangle delivered to your inbox by using the follow feature in the sidebar. Just enter your email address, and when you get the confirmation email make sure you say yes and you are all set! If you are on a mobile or tablet you will need to scroll to the bottom to find the follow feature. I like your workshop vers much and love to see more of it. Whipped wheel (with chain, couching, running and barred chain) are found here. 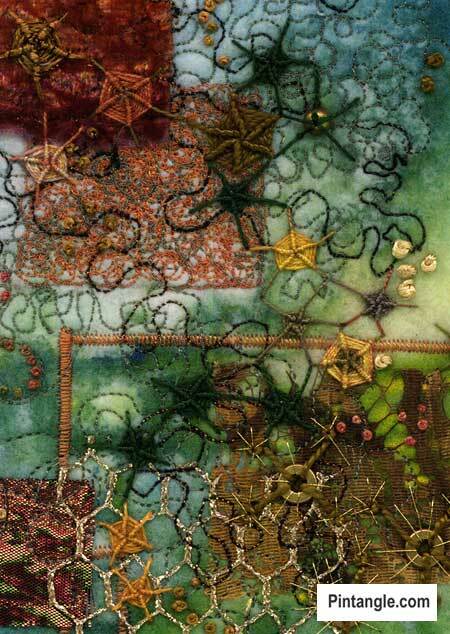 My project challenge is stitching onto paper. Now I only have to add more French knots to finish it!